A Pontifical is a liturgical book containing texts specifically to be used by a pope, archbishop, or bishop, such as for the consecration of bishops and of churches, the coronation of a king; various blessings, for a bell and a new well, for example; and many others. A flyleaf note records that the manuscript had belonged in the Middle Ages to Evesham Abbey, in Worcestershire. One of the most unusual features of this manuscript is its marginal decoration. 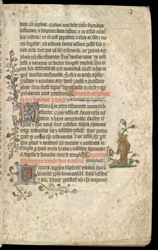 On this page a rabbit standing on its hind legs is baking something in a bread oven.